When we were kids we used to purchase DVDs of favorite movies to watch it but now those days are gone. Thanks to the internet that let you access digital content quite easily on various devices. There are many devices where we stream but watching on Smart TV is really amazing experience that’s why now we can find in most living rooms. There are many good TV brands but in this post we will stick about Samsung Smart TV. Samsung SmartTV are great but they just include remote control only, if you’re using Smart TV from long time you must be noticed or realized how difficult it can be to navigate through all the different features of your new smart tv using the remote but the good news is there is many wireless keyboards that unlock all inteligence features and upgrade your entertainment setup. There are many wireless keyboard in market but all won’t work with samsung TV, you may stuck with wrong product that’s why we came some best recommendation. 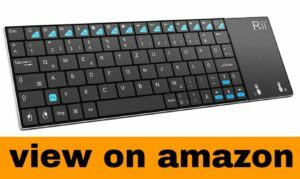 This Logitech K830 is one of the best wireless keyboard now a days, a wonderful pick for Samsung SmartTV. It’s simple design gives you maximum convince and there is plenty of navigation option. It’s 15 inch wide keyboard and layout is very optimized that gives you seamless experience as well as there is a lot of hot keys like mute, volume control as well as there are bunch multimedia keys that provide you extra functionality like open the music player or launch a browser. It’s has smooth touchpad with accurate cursor control enclosed within it. It has long battery life, it can last 10 days on full charge, so you need not worry about your keyboard battery. It’s very good keyboard, look premium texture and metal like finish and layout is optimized for seamless, lean-back navigation. It’s totally a value for money but one thing i should tell – You need little practice for using it. 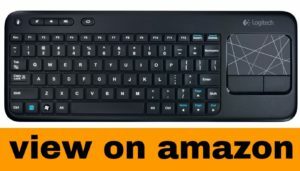 Logitech K400 is another best wirless keyboard that works good with TV or Laptop. If you’re looking a affordable and compact design keyboard then you must consider it. 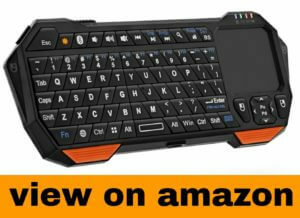 It’s a very good keyboard and specially designed as multimedia as a multimedia tool. Simple to uses, plug and play functionality, Quiet keystrokes, Convenient touchpad with multitouch support and Exceptional battery life are some best features that compel us to grab it where there are some drawbacks No backlit keys, No dedicated number pad and built quality is not so premium. 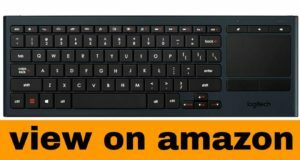 This is very affordable keyboard, you can buy under $30 but for Logitech K830 you have to cost more than 2X. Logitech K400 is one of the best pick for your Samsung SmartTV, you will absolutely love it. This Fosmon mini wireless comes with very lightweight and cool design. It’s unique by look that attract many users to pick it for smart TVs. This is 6 inch wide ( indeed small) fits in your hand. Navigate the cursor easily with your thumb without having to touch your screen, mouse or keyboard. It’s specially designed for searching, browsing or steaming on SmartTV but it is compatible in all types of devices like Apple TV, Amazon Fire Stick, Google TV, Xbox 360, PlayStation 4, Notebooks and Smartphones. It takes approx 2- 2.5 hour to full charge, with continues work it will run upto 10 days and in stand up mode it will run upto 50 days. It’s cute, attractive, light weight keyboard under $25, totally value for money. Many people prefer this for SmartTV but certainly it will be not a great choice for computer or laptop. If your requirement is only SmartTV then go for it, perfect one. 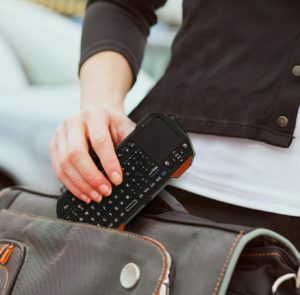 Rii Mini K12 is another great wireless keyboard that comes with sleek wide design with stainless steel backing that make it sturdy and durable. If you’re looking for a full QWERTY keyboard with built in multi touchpad with sleek and stylist design then this can be perfect pick for you. In look we will give 9 out of 10 rating. Not only for Samsung SmartTV, It will be a great pick for laptop and desktop. It let you operate from a distance up to 30 feet, that’s quite impressive. For your SmartTV, this is worth going for. These are top four keyboard recommendation for your Samsung SmartTV, all are fine choice and will suit your requirement. The overall winner is Logitech K830 that comes with awesome built quality, compatibility and user friendly but yes relatively expensive. Other keyboards are also great and best in budget, you will not regret in buying these.